Mulching conserves water by slowing evaporation, helps keep weeds from taking over by inhibiting their germination, and can create an environment conducive to earth worms, other beneficials, and the breakdown of organic matter into humus. On the other hand, using too much or the wrong kind of mulch can slow soil warm-up in spring, inhibit vegetable seed germination, harbor some undesirables like slugs and pill bugs, and create an environment conducive to the development of mold and other diseases. The trick is to match the right mulch in the right amount at the proper time. Read below for what has worked for me. 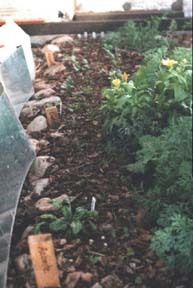 Last fall I experimented with two different kinds of mulch: alfalfa and leaves (Siberian elm and cottonwood primarily). Outside the alfalfa is wonderful; it adds nutrients and growth stimulation, smothers weeds, and stays put in the wind. Snow melt water is retained for a long time and worms love it. Inside the greenhouse was another story! It rotted too quickly, became a source of moldy growths, made a mess in both its application and removal, and basically was a big mistake, not to be repeated. Newly planted spinach and carrots in mid-November poking through a light leaf mulch. Notice the flashing on the left which is used to bounce light onto the new seedlings. Leaves, on the other hand (at least here in arid, out on the mesa of northern New Mexico) are not so great by themselves outside. Since it is so dry and windy here, especially in spring, and they are so high in carbon and light in weight, they don�t break down very easily, don�t add much to the soil compared to alfalfa, and tend to blow away. But put them into a protected, humid greenhouse and the "forest floor" effect takes place. Worms love them and "digested" two complete batches (about four inches worth in both applications) from September to mid-May, both increasing the worm population and creating worm castings and leaf mold, two great soil amendments. Also, brassicas, which are one of the major vegetable families for the winter greenhouse season, love leaf mold. In mid-May I removed all the mulch that was left on the ground prior to adding soil amendments and planting the summer crops. This was a very helpful process as I was able to remove most of the new crop of cut worms and slugs as well as cleaning up a potential repository of disease organisms. The old mulch, and all old plant stems, etc. went into the outdoor compost bin to be further recycled. 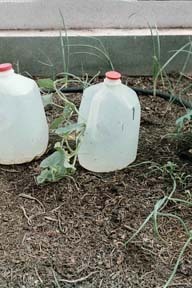 Newly transplanted melon and onion plants in a light mulch of pine duff, end of May. The milk jugs store and release heat to help give the heat-loving melons a boost. For the summer crops I am trying out a light mulch of pinon pine duff-a combination of the local variety of pine needles and sandy topsoil. It is a brown, finely textured, acidic material that will hopefully allow the soil to heat up and maybe even lower the pH a little. So far it is working well, although the weeds love it as much as the vegetables. Come fall, a new batch of leaves will return to the soil as the winter mulch, helping to hold in the heat of summer, retain moisture, and nurture a new crop of earthworms.